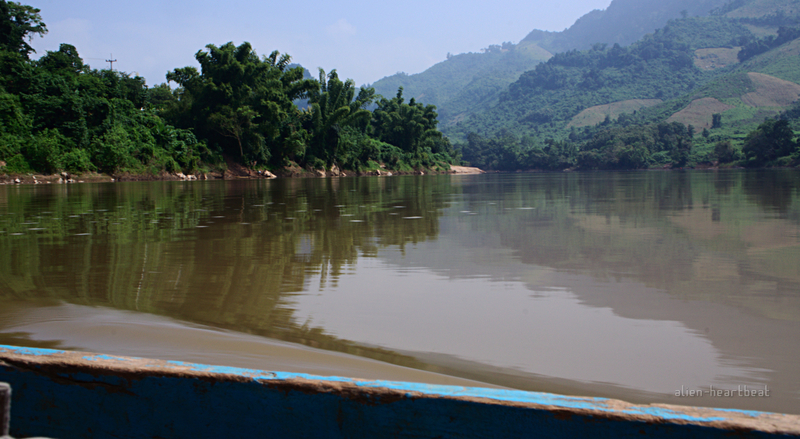 Laos is mountains. So I find a guide: he is dry and cheerless and carries a machete. He may like me already. I take the usual stuff: water, food, knife, sleep bag, mosquito net, medical kit, and enough plaster to cover the human body 11 times. Usually that is enough. We first cross the Nam Oo river. A boatman in a small narrow boat picks us up. The boat sits low in the water and is unstable. I carefully find the best place for my feet and undo my laces just in case. 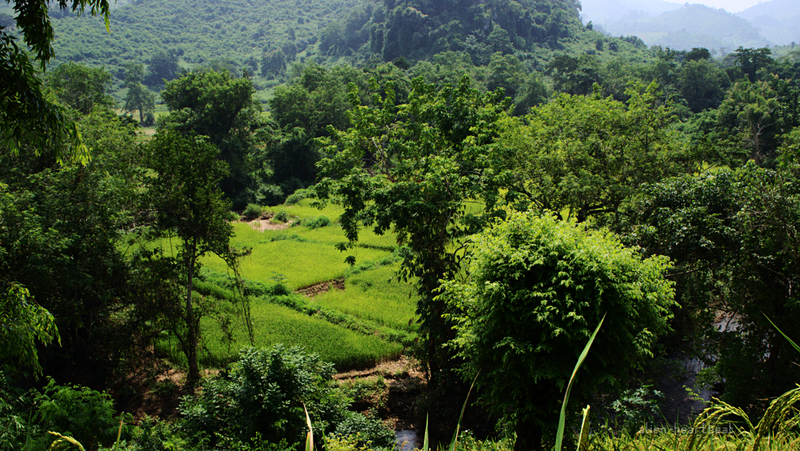 We start on a well-worn track, skirting rice-fields and following a stream. Women covered head to foot work the fields in the hot sun. The track becomes overgrown and the guide’s machete comes out. But it is not much of a machete. Now the Malagasy, they know about machetes – probably why they are so cheerful. Then in the distance I see the rising of mountains. thanks. I was a bit disappointed when I realised how few I had actually taken that were in any way useful in showing the place. I like how you keep it real. interesting comment. my sympathies lie with the impressionists, and I usually pick just a few aspects and try to offer an impression of them. By “real”, I meant that your words are free of bravado. It’s refreshing. seems like your travels are the perfect projection of my ambitions of travel… this ambition pales even in comparison with your descriptions and pictures (which probably pale in comparison with your actual experience). I like how you don’t leave out what’s in the foreground (greenery, part of a boat), which gives your photos more perspective. Great work!